I got early press access to the New York Comic Con to check out some games before lines start forming.First stop: The EA boot to get some time with Battlefield 1943: Pacific. Battlefield 1943: Pacific is a download only, multiplayer game for the Xbox 360, Playstation 3 and PC. The game, while new, is essentially a high-def remake of Battlefield 1942, and focuses more on pickup and play style gameplay. This is the first public demo available for fans to play. One multiplayer map on the New York Comic-Con show floor at the EA booth. Gordon Van Dyke, associate producer at Dice, was on hand to first show me through some of the new features for the game before I messed around with it. Unlike previous Battlefield games, Pacific only has three unit classes: Infantry, Riflemen, and Scout. Gone are the Medics and Heavy weapons classes. Van dyke explained they wanted every class to be able to fight in every situation. Every class has weapons to fight against the biggest tanks and armor. I would like to have seen more classes with varied abilities and risks. Also, players have auto-health and unlimited ammo. I find auto-health to be too simple and easy and unlimited ammo means players will be firing without thinking. That will probably mean no more knife fights. The destructible environments were a breath of fresh air for me. As someone who played a ton of the original 1942, nothing was more infuriating that driving into a tree and getting stuck. Now, I can run them all over and blow chunks of buildings away. Van Dyke said the game has about the same amount of destruction depth as Bad Company. I also liked the upgraded graphics. 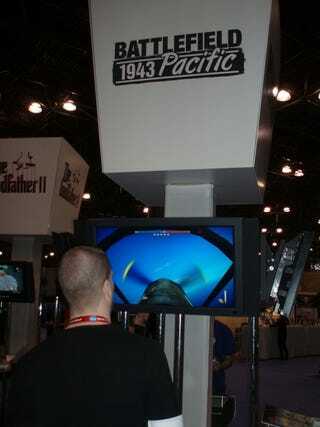 While the original 1942 was fine graphically, 1943 Pacific adds more detail, physics, shadowing, and overall effects. It's very clean looking and stays true to the original maps. I really had no idea what to expect from this game. I was presently surprised to see my favorite online game ever get a much-needed upgrade. The one concern I have is that this won't seem like a completely new, full Battlefield game. There won't be as many maps in the final game and the focus on casual play has me worried. Van Dyke wouldn't specify, but he said if this Battlefield gets a good reaction from fans, Dice might consider adding more and more content down the road. Confused about our previews? Read our FAQ.